Capoeira (/?kæpu??? ?r?/; Portuguese pronunciation: [kapu?ej??])) is a Brazilian martial art that combines elements of dance and music. It was developed in Brazil mainly by Africans beginning in the 16th century. It is known by quick and complex moves, using mainly power, speed, and leverage for leg sweeps. Capoeira is believed to be connected with tribal fighting, called Engolo, from the Benguela Highlands region of Angola. In many tribes in Africa, a tradition exists where people fight each other in order to acquire a bride or desired women. They fight body to body, without weapons, and are held inside a circle. In the 16th century, Portugal had claimed one of the largest territories of the colonial empires, but lacked people to colonize it, especially workers. In the Brazilian colony, the Portuguese, like many European colonists, chose to use slavery to supply this shortage of workers. In its first century, the main economic activity in the colony was the production and processing of sugarcane. Portuguese colonists used to create large sugarcane farms called engenhos, which were dependent on the labor of enslaved workers. Slaves, living in inhumane and humiliating conditions, were forced to work hard and often suffered physical punishment for any small misbehavior. Even though slaves outnumbered the Portuguese colonists, the lack of weapons, the colonial law, the disagreement between slaves coming from different African cultures and the lack of knowledge about the new land and its surroundings usually discouraged the idea of a rebellion. In this environment, capoeira was born not as a fighting style, but as a hope of survival. It was a hope of survival because they would say they were dancing when a colonist came along but really they were practicing fighting and preparing to fight back. A tool with which an escaped slave, completely unequipped, could survive in the hostile, unknown land and face the hunt of the capitães-do-mato, the armed and mounted colonial agents who were charged with finding and capturing escapees. So although they were outnumbering them without weapons they were hopeless but once they had learned how to fight they could break free. Soon several groups of slaves would gather and establish quilombos, settlements in far and hard to reach places. Some quilombos would soon increase in size, attracting more fugitive slaves, Brazilian natives and even Europeans escaping the law or Christian extremism. Some quilombos would grow to an enormous size, becoming a real independent multi-ethnic state. In 1808, the prince and future king Dom João VI, along with the Portuguese court, escaped to Brazil to flee the invasion of Portugal by Napoleon's troops. Formerly exploited only for its natural resources and commodity crops, the colony finally began to develop as a nation. The Portuguese monopoly effectively came to an end when Brazilian ports opened for trade with friendly foreign nations. Cities grew in importance as a result. Brazilians finally had permission to manufacture common products once required to be imported from Portugal, such as glass. At the end of the 19th century, slavery in the Brazilian Empire was doomed for many reasons, including growing quilombo militias raids in plantations that still used slaves, the refusal of the Brazilian army to deal with escapees and the growth of Brazilian abolitionist movements. The Empire tried to soften the problems with laws to restrict slavery, but finally Brazil abolished the institution on May 13, 1888, with a law called Lei Áurea, sanctioned by imperial parliament and signed by princess Isabel. Free, black people found themselves completely abandoned. The majority had nowhere to live, no jobs and were despised by Brazilian society, which usually viewed them as lazy workers. To make things worse, in this period there was a huge increase of immigration from Europeans and Asians, which left most former slaves with no hope of employment. Soon Capoeira practitioners started to use their skills in unconventional ways. Criminals and war lords used capoeiristas as body guards, mercenaries, hitmen, henchmen. Groups of capoeira practitioners, known as maltas, raided Rio de Janeiro. In 1890, the recently proclaimed Brazilian Republic decreed the prohibition of capoeira in the whole country. Social conditions were chaotic in the Brazilian capital, and police reports identified capoeira as an advantage in fighting. After the prohibition, any citizen caught practicing capoeira, in a fight or for any other reason, would be arrested, tortured and often mutilated by the police. The art of capoeira, after a brief freedom, was once again condemned and repressed. Cultural practices, such as the roda de capoeira, were conducted in far or hidden places. Often practitioners would post sentries, to warn if the police were approaching the area. In the 1920s, when Capoeira repression had declined, Mestre Bimba, a strong fighter from Salvador both in legal and illegal fights, met with his future student, Cisnando Lima. Both thought Capoeira was losing its martial roots, since many practitioners were using the art's most ludical side only to impress and entertain tourists. Bimba began developing the first systematic training method for capoeira and, in 1932, founded the first ever Capoeira school. Advised by Cisnando, Bimba decided to call his new style Luta Regional Baiana (meaning regional fight from Bahia), as the word capoeira was still forbidden by Brazilian law. In 1937 Bimba founded the school Centro de Cultura Física e Luta Regional, having gained official permission from Secretaria da Educação, Saúde e Assistência de Salvador (Salvador’s Secretary of Education). His work was very well received, and Bimba taught capoeira to the cultural elite of the city. By 1940, capoeira finally lost its criminal connotation and was removed from the penal code. Soon the notoriety of Bimba's Regional style proved to be a problem to traditional capoeiristas, who were gradually losing visibility and were still distrusted by society. This imbalance began to change with the founding of Centro Esportivo de Capoeira Angola (CECA), in 1941, by Vicente Ferreira Pastinha. Located in the neighbourhood of Pelourinho, in Salvador, this school attracted many traditional capoeiristas, who wanted to maintain what they knew as original practice. CECA's prominence led to the term, Capoeira Angola being identified as the traditional capoeira style. 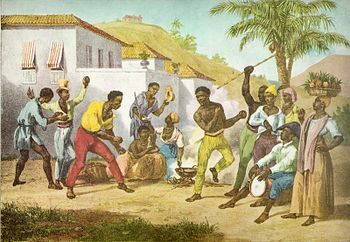 The term was not new, as during the 19th century playing capoeira in some places was referred to as brincar de angola (meaning playing Angola). But other masters, including some who did not follow Pastinha's style, adopted it. Capoeira is a fast and versatile martial art which is historically focused on fighting outnumbered or in technological disadvantage. The attacks in the Capoeira should be done when opportunity arises and must be decisive, like a direct kick in the face or a vital body part, or a strong takedown. Most Capoeira attacks are made with the legs, like direct or swirling kicks, rasteiras (leg sweeps), tesouras or knee strikes. The head strike is a very important counter-attack move. Elbow strikes, punches and other forms of takedowns complete the main list. The defense is based on the principle of non-resistance, meaning avoiding an attack using evasive moves instead of blocking it. Avoids are called esquivas, which depend on the direction of the attack and intention of the defender, and can be done standing or with a hand leaning on the floor. A block should only be made when the esquiva is not possible. This fighting strategy allows quick and unpredictable counterattacks, the ability to focus on more than one adversary and to face empty-handed an armed adversary. A series of rolls and acrobatics (like the Cartwheels called aú) allows the capoeirista to quickly overcome a takedown or a loss of balance, and to position themselves around the aggressor in order to lay up for an attack. It is this combination of attacks, defense and mobility which gives Capoeira its perceived ‘fluidity' and choreography-like style. The Roda (pronounced [??od?]) 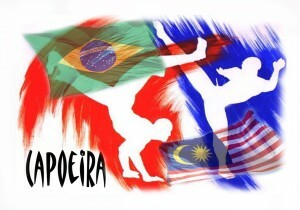 is a circle formed by capoeiristas and capoeira musical instruments, where every participant sings the typical songs and claps their hands following the music. Two capoeiristas enter the roda and play the game according to the style required by the musical instruments rhythm. The game finishes when one of the musicians holding a berimbau determine it, when one of the capoeiristas decide to leave or call the end of the game or when another capoeirista interrupts the game to start playing, either with one of the current players or with another capoeirista. The “Batizado” (baptism, in English) is a ceremonial roda where new students will get recognized as capoeiristas and earn their first graduation. Also more experienced students may go up in rank, depending on their skills and capoeira culture. In Mestre Bimba's Capoeira Regional, batizado was the first time a new student would play capoeira following the sound of the berimbau. Students enter the roda against a high-ranked capoeirista (a teacher or master) and normally the game ends with the student being taken down. In some cases the more experienced capoeirista can judge the takedown unnecessary. Following the batizado the new graduation, generally in the form of a cord, is given. Traditionally, the batizado is the moment when the new practitioner gets or formalizes his or her apelido (nickname, in English). This tradition was created back when Capoeira practice was considered a crime. To avoid having problems with the law, capoeiristas would present themselves in the Capoeira community only by their nicknames. So if a capoeirista was captured by the police, he would be unable to identify his fellow capoeiristas, even when tortured. Chamada means ‘call' and can happen at any time during a roda where the rhythm angola is being played. It happens when one player, usually the more advanced one, calls his or her opponent to a dance-like ritual. The opponent then approaches the caller and meets him or her to walk side by side. After it both resume normal play. Malandragem is a word that comes from malandro, which means a person who possesses cunning as well as malicia (malice, in English). This, however, is misleading as the meaning of malicia in Capoeira is the capacity to understand someone's intentions. In Brazil men who used street smarts to make a living were called malandros. Later the meaning expanded, indicating a person who is a quick thinker in finding a solution for a problem. Similarly capoeiristas use the concept of “mandinga”. Mandinga can be translated into magic, or spell, but in capoeira a mandinguero is a clever fighter, able to trick the opponent. Mandinga is a tricky and strategic quality of the game, and even an certain esthetic, where the game is expressive and at times theatrical, particularly in the Angola style. The roots of the term mandingueiro would be a person who had the magic ability to avoid harm due to protection from the Orixas. A capoeira bateria showing three berimbaus and a pandeiro. Capoeira instruments are disposed in a row called bateria. It is traditionally formed by three berimbaus, two pandeiros, one atabaque, one agogô and one ganzá, but this format may vary depending on the Capoeira group's traditions or the roda style. The berimbau is the leading instrument, determining the tempo and style of the music and game played. Two low pitch berimbaus (called berra-boi and médio) form the base and a high pitch berimbau (called viola) makes variations and improvisations. The other instruments must follow the berimbaus rhythm, free to vary and improvise a little, depending upon the Capoeira group's musical style. Angola: It is traditionally the first rhythm to be played in a roda. Its rhythm requires Capoeiristas to have a game that is slower and more strategical. Capoeiristas usually play with their hands on the ground for most of the game, displaying strength and equilibrium. São Bento Grande: Probably the most famous toque. It calls for a lot of energy, acrobatic movements, fast take downs and leg sweeps, making it ideal for energetic presentations. São Bento Pequeno: This rhythm is played to call an intermediate game between Angola and São Bento Grande. It requires both a high and low stance in the game, preferably in very close distance. Iúna: A toque created by Mestre Bimba and used in Capoeira Regional. A medium-paced and graceful game, it is played traditionally by “formados” (graduated students) at the end of the roda. Throws (baloes), in which partners throw each other and must land on their feet, are inserted within the game. In other traditions, Iúna is a funeral toque. Cavalaria: This toque carries anxiety and stress. Historically, when Capoeira was still prohibited this toque was used to alert capoeiristas that the police was coming, so they could escape before the practice being discovered. Today it is used to warn players of an imminent danger or disagreement in the game. Idalina: A relaxed, dominant rhythm where the game is played with razors and knifes. Since the end of Capoeira prohibition, knifes or razors are unlikely to come around the roda, so usually this toque is played only in some presentations. Many other toques, like Samango, Santa Maria, Amazonas, Regional de Bimba, Benguela or Miudinho have their own story, meaning and game style. Determining styles in capoeira is a very tough task, since there was never a unity in the original capoeira, or a teaching method before the decade of 1920. However, a division between two styles and a sub-style is widely accepted. Existing in many parts of Brazil since colonial times, most notably in the cities of Rio de Janeiro, Salvador and Recife, it's impossible to tell where and when Capoeira Angola began taking its present form. The name Angola starts as early as the beginning of slavery in Brazil, when Africans, taken to Luanda to be shipped to the Americas, were called in Brazil black people from Angola, regardless of their nationality. In some places of Brazil people would call capoeira as playing Angola and, according to Mestre Noronha, the Capoeira school Centro de Capoeira Angola Conceição da Praia, created in Bahia, already used the name Capoeira Angola illegally in the beginning of the 1920 decade. The base of Capoeira Regional is the original Capoeira without many of the aspects that were impractical in a real fight, with less subterfuge and more objectivity. Training was mainly focused on attack, dodging and counter-attack, giving high importance to precision and discipline. Bimba also added a few moves from other arts, notably the batuque, old street fight game practiced by his father. Use of jumps or aerial acrobacies was kept to a minimum, since one of its foundations was always keeping at least one hand or foot firmly attached to the ground. Mestre Bimba often said, “o chão é amigo do capoeirista” (the floor is a friend to the capoeirista). The traditions of roda and Capoeira game were kept, being used to put into use what was learned during training. Musical instruments disposition, however, was changed, being made by a single berimbau and two pandeiros. The Luta Regional Baiana soon became popular, finally changing Capoeira's bad image. Mestre Bimba made many presentations of his new style, but the best known was the one made at 1953 to Brazilian president Getúlio Vargas, where the president would say: “A Capoeira é o único esporte verdadeiramente nacional” (Capoeira is the only truly national sport). Nowadays the label Contemporânea applies to any Capoeira group who don't follow Regional or Angola styles, even the ones who mix Capoeira with other martial-arts. There are many entities (leagues, federations and association) which have tried to unify the graduation system. The most usual is the system of the Confederação Brasileira de Capoeira (Brazilian Capoeira Confederation), which adopts ropes using the colors of the Brazilian flag, green, yellow, blue and white. Even though it's widely used with many small variations, many big and influential groups still use different systems. Even the Confederação Brasileira de Capoeira is not widely accepted as the Capoeira's main representative. Even though those activities are strongly associated to the Capoeira, they have different meanings and origins. Performed by many Capoeira groups, samba de roda is a traditional Afro-Brazilian dance & musical form that has been associated with Capoeira for many decades. The orchestra is composed by pandeiro, atabaque, berimbau-viola (high pitch berimbau), chocalho, accompanied by singing and clapping. Samba de roda is considered one of the primitive forms of modern Samba. The 1993 film Only the Strong is centered around Capoeira. The 2004 film Ocean's Twelve shows Toulour practicing Capoeira and using it to evade the heavy security lasers. The 2005 film The Protector shows a duel from Muay Thai fighter Tony Jaa and Capoeira fighter Lateef Crowder. The 2008 film Hellboy 2: The Golden Army featured movements of Capoeira in the fighting sequences with Abraham Sapien. Doug Jones learned many Capoeira techniques for the character. The 2011 movie Rio shows Common marmosets (Callithrix jacchus) who are experts in Capoeira. in the 2011 Marvel Studios film Thor, Tom Hiddleston practiced the art of Capoeira for his role as Loki. The 2009 filme Besouro, shows the influence of Candomble's religion and Capoeira. The 2011 film Never Back Down 2, One fighter concentrated in the art of Capoeira and later used it in a cage match. In the TV series Stargate SG-1, the episode entitled “The Warrior” (season 5, episode 18) features a fictional martial art called “mastaba”, which closely resembles Capoeira. In the cancelled TV series America's Best Dance Crew, the Pitbull Challenge (season 7, episode 6) featured the Elektrolytes having to do Capoeira. The 2011 TV series Bob's Burgers (Season 1 Episode 4) featured Capoeira instruction. The Tekken game series have two playable characters who use Capoeira fighting style, Christie Monteiro and Eddy Gordo. The Street Fighter game series playable character Elena uses Capoeira style. The Street Fighter II game manual states that Blanka is also a Capoeira fighter, differing from current character description. The Fatal Fury game series has two capoeira fighters, Richard Meyer and Bob Wilson, master and student. Richard Meyer was the first fighting game character to use Capoeira. The game King of Fighters: Maximum Impact features Soiree Meira, a German Capoeira user. The game Eternal Champions game character Trident is described as a master of Capoeira. In World of Warcraft the troll playable race can practice Capoeira. In Lost Saga, a playable hero is Capoeira. In Def Jam saga's, Dan-g, Lil Flip and Sean Paul is a Capoeira Fighter. Spiritonin (R) created the game of Capoeira Fighters 1, 2 and 3 Ultimate World Tournament, which has capoeira as main martial art. In the manga series Death Note, L uses Capoeira as his fighting style. In the manga series Tenjho Tenge, Bob uses Capoeira as his fighting style. In the manga series Black Lagoon, Fabiola Iglesias uses a self-taught Capoeira as her fighting style. ^ “”O Brasil no quadro do Antigo Sistema Colonial” (in Portuguese)”. ^ “Abertura dos portos brasileiros (in Portuguese)”. ^ “Gangues do Rio: Capoeira era reprimida no Brasil (in Portuguese)”. ^ “A abolição (in Portuguese)”. ^ “Código penal brasileiro – proibição da Capoeira – 1890 (in Portuguese)”. ^ a b “Os Manuscritos do Mestre Noronha (in Portuguese)”. Almeida, Bira “Mestre Acordeon” (1986). Capoeira: A Brazilian Art Form. Berkeley: North Atlantic Books. ISBN 0-938190-30-X. This article uses material from the Wikipedia article Capoeira, which is released under the Creative Commons Attribution-Share-Alike License 3.0.